Do You Know How to Mop a Floor with a Spin or Steam Mop? Mopping isn’t rocket science. Anyone can do it, but just like any other simple task, there are ways to do it better. With today’s innovations in mopping technology, the newer products are not as simple as the old fashioned yarn mops. Each type of mop has its own set of rules for best results, and even these vary from brand to brand. We offer great tips within our product reviews so you get a good idea of how to use each product. Here, we’ll dive a little deeper into spin and steam mops and how to get the most out of them. But first, let’s have a little rundown of some general best practices. While there are no hard and fast rules for mopping, there are some things that will make the job easier while keeping your floors looking their best. These apply to ALL mops. Don’t get mop crazy. Most floors only need mopping once or twice a month. More than that, and you risk laying down too much sticky cleaning residue that can actually trap dirt and dull the shine. Not to mention, wood floors can easily be damaged with too much moisture. Put the furniture (and kids) in time out. It may seem like it takes too much time, but in the long run, it will save you time from having to stop and move and scoot and bend, while also allowing a more thorough clean. Kids and pets and everyone else should be kept out until you’re done and the floor is dry. Try to schedule a time to mop when everyone’s out of the house or asleep. SWEEP OR VACUUM first!! Mopping without sweeping will just push the dirt around without picking it up. It can even scratch the floor and leave it looking like it’s barely been touched. In general, this is good advice for these common floors. However, always consult your manufacturer and follow their recommendations first. Best for hardwood – Polyurethane-finished flooring needs a mild or pH-neutral cleaner. Avoid acidic products. For wax-finished flooring, use either a waterless hardwood floor cleaner or a little mild detergent in water. For both types, use ONLY a dry or slightly damp mop. If any water is left standing on the floor, dry it with a clean rag. You can even set up an electric box fan to ensure the floor dries quicker. Move the mop in the direction of the wood grain so you’re not pushing dirt into the joints. Best for laminate – Since laminate is basically pressed wood with a thin layer of solid wood over it, same goes for the water. Only a dry or slightly damp mop is needed. Most common floor cleaners will leave residue on laminate, so look for cleaners made specifically for laminate. No waxes or polishes are needed. Best for vinyl / linoleum – Vinyl is generally very forgiving. You can use all sorts of cleaners, but be sure to consult your manufacturer’s recommendations to see what they suggest. However, one of the best (and cheapest) cleaners is apple cider vinegar diluted in water. It removes dirt, won’t leave a buildup, and disinfects. Linoleum needs gentle cleaners. You can clean with vinegar and water with just a drop of dish soap. Spray it on the floor one section at a time. Then use a damp mop to mop it up. Use a polish for your linoleum every 6 months or so to keep it shiny. Best for tile – For stone, a pH neutral, non-chelating cleaner is best since it won’t react with the minerals in the stone. Avoid bleach, ammonia and vinegar, or it could damage the sealant. For ceramic tile, white vinegar diluted in water is great for odor elimination, plus it’s cheap and non-toxic. Also called floating wood tile, is a multi-layer synthetic flooring product fused together with a lamination process. Laminate flooring simulates wood (or sometimes stone) with a photographic applique layer under a clear protective layer. The inner core layer is usually composed of melamine resin and fiber board materials. Also called Lino, is a floor covering made from materials such as solidified linseed oil (linoxyn), pine rosin, ground cork dust, wood flour, and mineral fillers such as calcium carbonate, most commonly on a burlap or canvas backing. Pigments are often added to the materials to create the desired colour finish. A tile is a manufactured piece of hard-wearing material such as ceramic, stone, metal, or even glass, generally used for covering roofs, floors, walls, showers, or other objects such as tabletops. Alternatively, tile can sometimes refer to similar units made from lightweight materials such as perlite, wood, and mineral wool, typically used for wall and ceiling applications. Apart from the motorized versions, most manual spin mops work in a very similar way. They offer a bucket that allows for hands-free wringing with a spinning basket. The spinner is operated with either a foot pedal or by pumping the spin mop handle. This is great for moisture control, which is what makes spin mops the best for hardwood floors. It’s really hard to wring out a yarn mop enough to make it safe for a wood floor. With a spin mop, you can leave it just barely damp enough to safely clean almost any flooring. Wring the mop out to the desired wetness. Begin mopping in one corner of the room, and work backwards so you’re not stepping on the wet areas. Work in small areas at a time. Rinse and wring between each area so you don’t spread dirt around. For spin mops specifically, the #1 mistake we’ve seen people make is not holding the mop vertically when spinning. This is especially true for the ones with handle-pumped operation. You can’t hold a spin mop at an angle and expect it to spin well. Also, make sure all the strands are in the spinning basket so you don’t have uneven moisture. When filling the spin mop bucket, don’t fill past the fill line to prevent overflow when you’re wetting and wringing out the mop. It may seem like there’s not enough water in there, but since the spinner is so efficient at wringing, it will maximize the water usage. When it’s time to wash the spin mop pads, toss them in the washing machine, but DON’T use fabric softener. It will hinder the absorption qualities of the fabric. Hang them up to dry and voila! They’re ready for next time. Be sure to check out our spin mop reviews to find one that’s perfect for you! Cleaning Expert tip: Use two buckets while mopping, one with clean water and your cleaning solution, and another to rinse and wring out the dirty water. Steam mops can save a lot of time and are great for those who don’t want to use any chemicals on their floors. They only require water, a power outlet, and a clean mop pad. They are more expensive than spin mops, however, and misuse could cause serious damage to your floors (or yourself) if you’re not careful. Steam mops come in many styles and sizes. They all have varying degrees of heat, accessories, and other features that are better in some situations than others. For instance, a small mop head will do a better job cleaning behind toilets and tight spaces than a large one you might want for a wide open space like a kitchen. You’ll need to begin with sweeping or vacuuming before you mop. 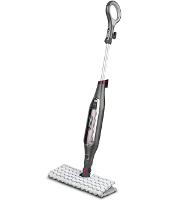 However, there are some combo vacuum/steam mops on the market which can save some time. But generally, these don’t clean nearly as well as a regular broom or vacuum. They’re best for maintenance cleaning. While some steam mops tackle stuck-on dirt pretty well, the pads are relatively thin and will only hold so much dirt. If you’re mopping a really dirty floor, you may need to go through 2 – 3 pads to get a truly clean floor. They don’t like hard water. Steam mops work best with distilled or filtered water with little to no minerals. Avoid using tap water, especially if you have hard water. Not only will it leave more streaks, but the mineral buildup inside the mop can clog the steam spray nozzles. They like attention. Don’t ever leave a running steam mop unattended on your floor. It can generate an insane amount of heat, which can damage even the sturdiest flooring. Not to mention, a kid or pet might get hold of it and burn themselves. So constant attention is necessary. They need more mop pads. While a spin mop pad can be rinsed out and used for several rooms at a time, steam mop pads aren’t so laid back. If you’re mopping more than one floor at a time, you’ll need extra pads on hand so you can have a clean one ready for the next room. The good thing is, most steam mops come with at least one extra pad and refill packs are pretty cheap. They wash well in the washing machine. Hang to dry and never use fabric softener. They get along best with sealed floors. Wood floors and steam mops don’t get along, especially your unsealed hardwoods. It’s very hard to control the moisture coming from a steam mop, and it can leave a lot of moisture between the joints that can warp and discolor the wood. You also run the risk of voiding your warranty if you use a steam mop on some brands of flooring. 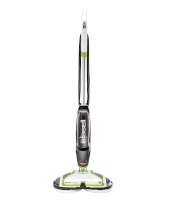 Be sure to check out our steam mop reviews to find one that’s perfect for you! Cleaning Expert tip: When shopping for a steam mop, look for efficient features like the ability to stand on its own, a removable water tank, hands-free pad removal, and an on/off switch. Cleanup.Expert is a participant in the Amazon Services LLC Associates Program, an affiliate advertising program designed to provide a means for sites to earn advertising fees by advertising and linking to amazon.com and affiliated sites.